Suddenly, explaining the magic of the universe seemed the better of the two, but it’s too late. We’re well beyond that. Your child has turned into a molten pile of screaming, tears, and for the super lucky: flying fists. A larger chunk of society assumes that children who are uncontrollable in a public place are the product of bad parenting. When a child breaks down at the store, our first thought is one of fear: "everyone's watching; they think I'm a bad parent; what's the fastest way to make this stop?" What you need to remember is that this isn’t about “people,” this is about you and your child. Those unhelpful, judging eyes in the store belong to people that mean nothing to you. If you give in to fear of their judgement, you could react in anger or desperation, both of which are the wrong course to take. If you react differently when your child throws a tantrum in a public place, it teaches them that those are the times to manipulate you. Now that we’re thoroughly ignoring the strangers, it’s time to resort to a constructive technique for teaching your child life lessons. If your parenting goal is to ignore this type of behavior, then do it. If you want your child to have a time-out like they would if you were at home, then do it. Make sure they understand that they face consistent consequences out in public as they would at home. If it continues with no end in sight, or they seem to be feeding off of the attention of onlookers, feel free to pick them up and haul them outside to sit in the car until they’re done (obviously windows down, doors open, and never leave them alone). Whatever you do, stick to your guns. No means no. The worst thing you can do is be inconsistent as a parent and give in to their demands. This shows your child that you are not the boss: they are. But you also must be willing to perform the consequences assigned. Pick your battles, my friend. If you're unwilling to commit to a public tantrum and time-out session, maybe the best response is to allow the child to pick out a treat with parameters you set in place. This will help you avoid a tantrum and time consuming consequences. 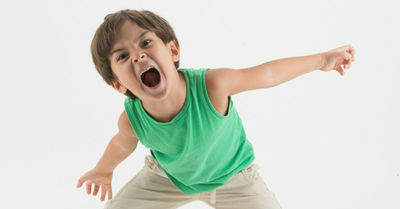 Tantrums in a public place can be terrible, but if you remain consistent and stay strong, they become fewer and farther between as the child learns they can’t get what they want that way. When worse comes to worst, you could always launch a preemptive strike and wrattle their little brains.